In which I devise and execute a plan to administer a powerful hallucinogenic drugs to our un-esteemed ex-prime minister. Some years ago, strangely enough, my company was responsible for designing and building the website for The Spectator. The Spectator (for the benefit of the non-Brits) is the journal of the UK conservative intelligencia (sic) specializing in literature, comment, satire and gossip. Every year the Spectator held a garden party at their headquarters, a Georgian terraced house in Doughty Street, London. This party is a well-established part of the annual social circuit for a certain strata of the media and political establishment and wouldn’t ever consider allowing the likes of myself access – however I was repeatedly invited to the party by a certain senior staff member whose intentions were far from platonic (let’s call her ‘P’), and smuggled past the security guards. As chance would have it, a random triangulation of events dropped an unmissable opportunity into my hands. Secondly, after one of our companies legendary parties, we discovered during a half-hearted clean-up, a small bottle of liquid in the fridge. A series of random tastings determined that the bottle contained extremely potent LSD – a small drop was enough to keep you in a Leary-like state for twelve hours. And so it was that, with no planning or preparation, I set off to Doughty Street with the little bottle (Drink me! ), Knowing full well that if my plan worked I was likely to disappear from society for a very long time – I would have been prime suspect amongst the Tory Party stalwarts, without doubt. The party was already in full swing when I arrived –Tories are as fond of getting lashed as any council estate ‘chav’ (they just get it free on expenses or deduct it from their tax bill) – tonight was no exception. This blurry bonhomie provided a suitable smokescreen to effectuate my plan. Laid out in the front room was a reception table for the Ironic Lady replete with several Methuselahs of champagne. I swiftly purloined one of these bottles and took it to the bathroom (a small room just at the top of the stairs), uncorked it as quietly as I could and poured the acid into the bottle. Just as I had finished my preparations I heard the front door open and a chorus of plummy Tory voices hurrahing and applauding. The great Leaderess had arrived too soon! This is where it all started to go wrong; In my haste to get downstairs and the bottle back on the table I violently opened the bathroom door. 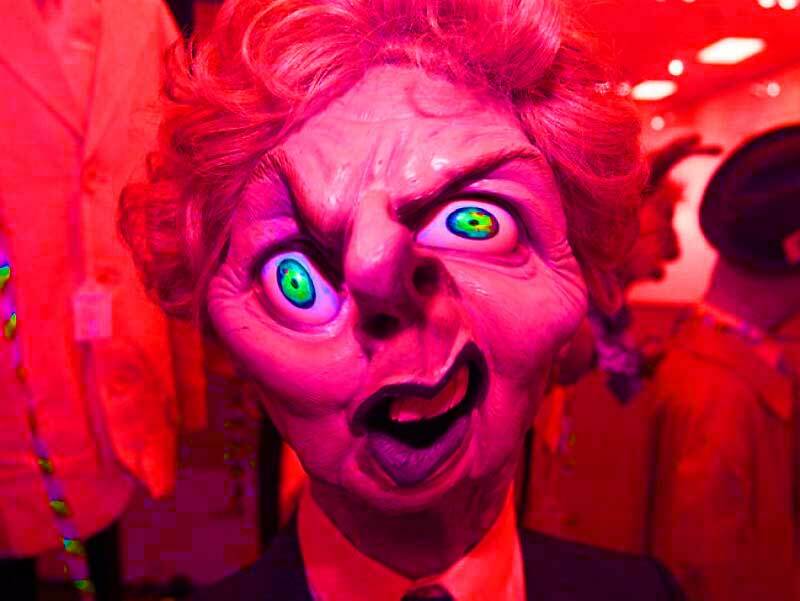 To my mixed horror and hilarity Norman Lamont, who had been patiently waiting for me to vacate the toilet was knocked down the stairs, cart-wheeling into the uxorious Cecil Parkinson sending a tray of champagne flying, missing the back of the ex-Premiere’s head by inches. Thatcher, completely oblivious to the chaos enfolding behind her, rapidly worked the room and was gone in five minutes with a flurry of minders and press photographers – without even touching any of the champagne she was proffered. I placed the tainted bottle back on the table and left the party.